Agonistic Judo, Aiki Jujutsu and Jujitsu for over 20 years. He started Jujitsu when he met Sensei Elliott in 1996. 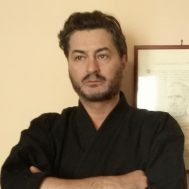 Nico is the head of Shin Ryu Jujitsu Renmei Italy. His clubs are recognised by the Italian National Government Body CONI and by the Sport association OPES Italia. Nico holds a 1st Dan in Aikijujutsu and a 2nd Dan in Jujitsu.